Libbys on the Loose:2 Humans. 2 Great Danes. 1 RV. 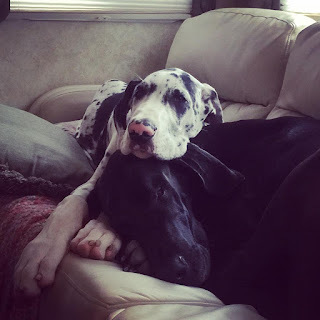 : Full-time living in an RV... with two Great Danes! Full-time living in an RV... with two Great Danes! 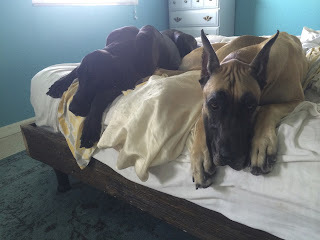 By now, if you are a regular follower of our blog and/or social media, you are well aware that we travel with two Great Danes, Nyx, a two year old black female, and Moose, a five month old harlequin male. In case you missed the post about Guinness aka "Squishy", he was our Wobbler's Syndrome baby that passed in April. He was with us four amazing years - more than we could have ever hoped. One thing that we didn't consider was that the name and our logo makes a lot of the people we meet think that the caricature of Guinness is Libby. To add to that, they wonder where "Libby" is and why she is on the loose. After explaining that our last names are Libby and that Guinness was part of our inspiration to start out on this journey, it all comes together for them. But there is still the question: "How do you live in an RV with two Great Danes!?" In the beginning of our planning (in fact, the first full week), we had a 23' toy hauler travel trailer - with no slide-outs. Two 100 lb+ dogs along with two humans in such a small area proved to be difficult and, as you can imagine, some complications. For a few nights, it wasn't bad. We had a loveseat in the back "hauler" area and the puppies' (Guinness and Nyx) beds were on the floor in front of it. It was "cozy" to say the least. In the making of the decision to go full-time (went hand-in-hand with our home rental), part of that decision was to upgrade our RV. After spending a full week in it this past February, by the last day of that week, we headed straight to the nearest RV dealer (that stocked what we were looking for). As luck would have it, RV Direct America in Titusville, FL had the selection and the 90 day warranty that we were looking for. Since we were going to be living in it full-time and we didn't have the funds (or desire) to buy a brand new one (weren't sure what exactly we needed yet), it was an absolute must to have a warranty. 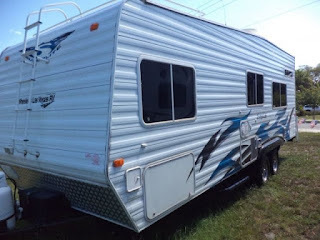 In addition, since we were staying at Manatee Hammock Campground for at least a month or two, any warranty work that needed to be done was able to be performed on-site without us having to move our "home". 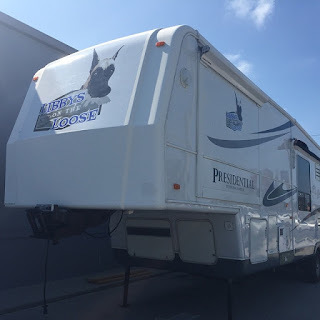 Although we didn't have any major issues (most of the problems were resolved before we took delivery), anything that did come up, RV Direct America was willing to send a tech to our site to fix it - talk about service! Fast-forwarding to summer, we are now in our Holiday Rambler 36' 5th wheel - complete with FOUR slide-outs! Needless to say, it was like moving from a small studio apartment to a house. Instead of an elevated area in the front with a mattress, we had a full on bedroom, complete with cedar-lined closet. A queen-size bed, full set of dresser drawers, and its own flat screen TV. To call this an upgrade would be doing a disservice to the word "upgrade"! The only downside to a bigger rig was that (as I discovered) I was going to need a bigger truck. Not because the truck I had previously couldn't pull it (2007 Dodge Ram 2500), but because the payload was not sufficient for the pin weight of the trailer. We ended up with a 2011 Dodge Ram 3500 4x4. While it hasn't been the best, we'll save that trial for another story. So, to the story's title, how exactly do we live with Great Danes in an RV. For one, they are not typically high energy dogs (once they are adults - about three years old). That being said, a well-exercised dog is a happy owner, especially with young Danes! Imagine two 100+ lb dogs "playing" inside the smaller space of an RV - you get the picture. Two things go hand-in-hand here. The first being good training. Moose and Nyx are our fifth and sixth Danes. That's not to say that we are experts by any means on the breed, but we have had the help and guidance of a lot of experts in both training and (unfortunately) medical issues. We are both on the same page about being firm with our training while still allowing the doggies to be doggies. For instance, when it's time for their "meals"(they get two meals a day with added treats but we free-feed them by keeping their bowls full of their normal food), we always make them lay down and wait until it's time to eat. This helps us to keep our established dominance with them, especially our young Moose! The key to training dogs is much like (we've heard) raising kids - if the parents aren't in agreement and on the same page, the kids will exploit one or the other to get what they want. This happens with dogs, too! Repetition and consistency will go a long way to aid in training. By constantly doing these things, each passing day gets a little easier handling them. The second is keeping the dogs exercised - especially since they are both still growing puppies. One of the things that we look for in an RV park or campground is either a designated dog park or area, or a large field where they can run wide open, or at the very least, somewhere nearby that they can play. Even on the days that we are travelling, we keep our time on the road limited to six total hours or less. We rarely drive more than two hours at a time without a good rest stop, both for us and the kids! We normally take Moose for a short walk in the morning, one midday, and one evening - mostly for going to the bathroom. Since he is still very young, we have been teaching him how to stay close since we do not use a leash on him much yet. For his age, he's already listening amazingly well and staying close! Of course, Moose does have Nyx as an example. She stays closer and listens better off-leash than she does when she's on - weird! Nyx is able to walk much further with us since she is over 2 years old. 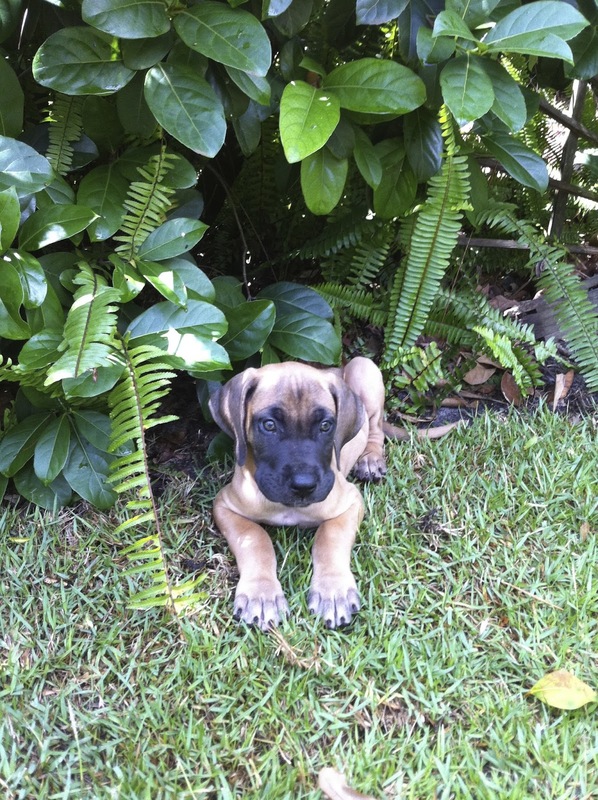 Since her growth plates are closed (Great Dane growth plates close at about 18 months), the potential for irregular bone growth and a host of other potential problems decreases dramatically. Disruptions in the growth plates in these big guys can cause serious health complications later in life. We've had enough health issues with our previous Danes, so we have been extremely careful following the expert guidance of Nyx and Moose's respective breeders. So with these two very large dogs, one has to wonder what happens when they decide to start playing in the RV. Fortunately, they are pretty good at listening and keep most of their playing to outside. However, there are times when we just like to let them go at it (within reason) for a bit. No joke, it sounds like a herd of elephants stampeding through the RV, but they love it and are generally pretty agile - we just make sure to supervise and watch them closely. We did have to make some light modifications to our rig since Moose is still very young. Since he's still crated at night and when we leave for short periods, we did have to remove the dining table and chairs. While this would normally cause issue, thankfully, my in-laws got us a lightweight portable picnic table for my birthday. It's small enough to set up in the living area, but large enough to seat four adults and has room on the table for a full meal. Since it's so lightweight and easy to setup (just unfolds), if we want to, it's easy to set up for a great outdoor dining experience! 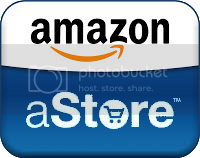 Check out our Amazon Store where we be adding this awesome picnic table! Another potential challenge are RV parks that don't allow larger dogs. The only place that we had issue (so far) with this was in South Florida. From Ft. Lauderdale to the upper Keys only allowed small dogs. While this is frustrating, we understand that each place has its own set of rules. That being said, we are also staunch believers in pets being members of the family, so we simply boycott these places! There you have it. Hopefully this post disposes of any preconceptions or preconceived notions about traveling with larger dogs. It's really not difficult and we wouldn't have it any other way. While it is certainly a challenge, we imagine it's along the same lines as full-timing with kids (from what we've heard from other full-timers with children!). Training, exercise, and consistency are the keys to ensuring that traveling with your big babies is a enjoyable as ours! Did we get it right? Do you have experience or knowledge about this post? Please make yourself heard! Comment below and we will respond as soon as possible. As always, thanks for following us! Disclaimer: We are not paid writers. We write for enjoyment and to share information about our travels with our families, friends, and our followers. The information that we provide is based on our experiences with the products, services, etc, that we write about. Our opinions are 100% non-biased! 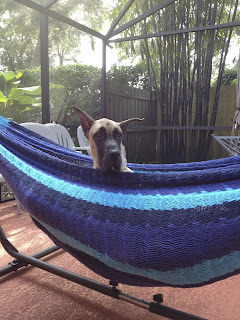 I've been traveling with a friend and 2 Great Danes (a brindle and a blue, both females). I started out with a 25' Winnebago View with a full-size permanent bed (mine), a cabover bed (friend's), and a dinette that turned into a bed (dogs'). I thought this would be perfect, because everyone had their spot. Nope. It was difficult to maneuver past each other, especially with the dogs always wanting to be off their dinette bed: there was very little walkway. There was also a lack of sitting area for the humans because the dinette was always in bed form. I eventually got a 35' Tiffin Allegro with a bedroom in the back and a dinette/bed, couch, and 3 chairs in the front. There is plenty of walkway due to opposing slides in the front (feels like a condo more than a car). Unfortunately we only had a trip or two before both Danes passed away at 12 yrs old. I'm in the market now for another Great Dane (#4 for me), but probably just 1 while I'm traveling. I will say that one of the Danes was a great traveller due to her uber-calm disposition, but the other had serious lifelong anxiety problems which made traveling not the best idea for her. Good luck and happy traveling with your gorgeous Danes! Thank you so much for the post! We can't imagine traveling without our two babies. Whenever we start pulling the slides in, they know it's time to get on the road - they love it! Are you planning to get another Dane? Are y'all still traveling? I am beginning my new adventure this month with my 2 danes (6 and 8 years old respectively), and am looking for tips. Will be in a 30' TT. Just me and my babies --- no spotter. I'm a little scared as I'm totally a newbie and starting life over after 65 ... suggestions?